On December 16, 2016, while exploring one of the last unexplored areas of Jungle Gardens with Dylan Derouen, where predominately cultivated Camellias and Azaleas abound, we discovered yet another unknown tree. The first specimen we encountered was juvenile and possessed the most attractive small, ovoid, shiny leaves. It was heavily armed with long thorns. Quickly, we found additional young plants and, ultimately in the same area, a large tree. Later that morning not far from the location of the first plants, we discovered a grove of 12 trees, 10 of which are very large. These trees had considerably larger leaves than the juvenile plants. They also possessed numerous thorns on their new growth and retained very large, branched thorns on the main trunk of the tree. These large thorns are essentially identical to thorns found on the native Honey Locust tree. Such large, branched thorns do not occur commonly on large trees, and, therefore, were of great value in the identification of this new discovery. Using online resources, I was able to determine that the trees were likely either Flacourtia or Xylosma. These two genera are very closely related. Both were previously placed in the now defunct family Flacourtiaceae,. Now they are considered members of the Willow family, Salicaceae. The larger mature trees did possess a few small, dried-up inflorescences. They were of no help in the identification process, but at least we knew the trees had previously flowered. While the type foliage found on these trees suggested they might be deciduous, they are essentially evergreen. During two successive winter seasons, one of them a harsh winter, the trees never dropped their foliage, despite the literature stating that in freezing weather they may defoliate. I carefully inspected the grove of trees throughout the following year, hoping to observe them flowering. All spring I visited the grove and no flowers were ever found; again throughout the summer, no flowers. 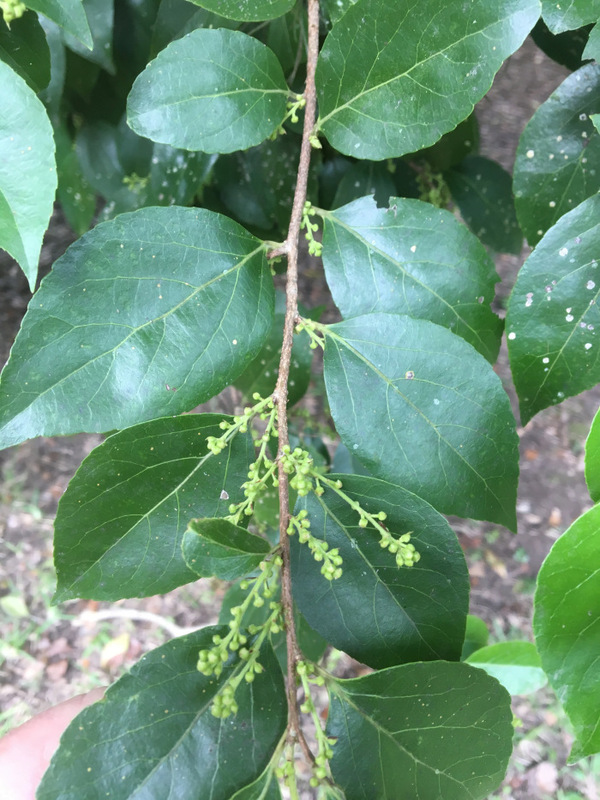 In the fall, however, during the last weeks of September I noticed numerous small flower buds appearing along the stems in the leaf axils of every tree. During the first week of October, 2017, when I visited the grove, every tree had thousands upon thousands of short stalks covered in tiny yellowish green flowers. The area was filled with the sound of bees. I would say that every bee on Avery Island was at this grove on the day I first visited. I collected ample material and returned to Archives to press several specimens and try to finally identify the tree. As I studied the small flowers using a dissecting scope, I quickly realized that all were staminate (male; pollen producing); none were female. I returned to the grove the following day and examined the flowers on every tree. The entire grove had only male flowers. I went to the first trees we had found, located a short distance from the grove, and those, too, had only male flowers. With flowering material in hand, I began trying to identity the trees using the online key to the Flora of China. Much to my dismay, the final couplet in the key does not distinguish between the two genera without the presence of female flowers, of which I had none. I sent him pressed specimens, and he confirmed the trees as Xylosma conjestum, a Brush Holly. I continued to observe the grove of Brush Hollies daily. They were in flower for about seven continuous days, and by the following week no flowers remained on any tree. Brush Hollies are generally grown and shaped as hedges, not trees. Adam Black of Peckerwood Gardens in TX, visited Jungle gardens and commented that these were the largest specimens he had ever seen. The largest tree in the grove is 17 inches in diameter all others have a diameter between 11 and 12 inches. He felt they could be the largest examples of Xylosma congestum in the United States. History: This genus contains about one hundred species of evergreen trees and shrubs, found everywhere in the tropics and subtropics except Africa. When in bloom, Xylosmas attract bees in droves which makes this plant valuable in all types of gardens.